Donald Trump vs. the media: How he could curtail freedom of the press as president. Would President Trump Kill Freedom of the Press? What he couldn’t do—and what he could. 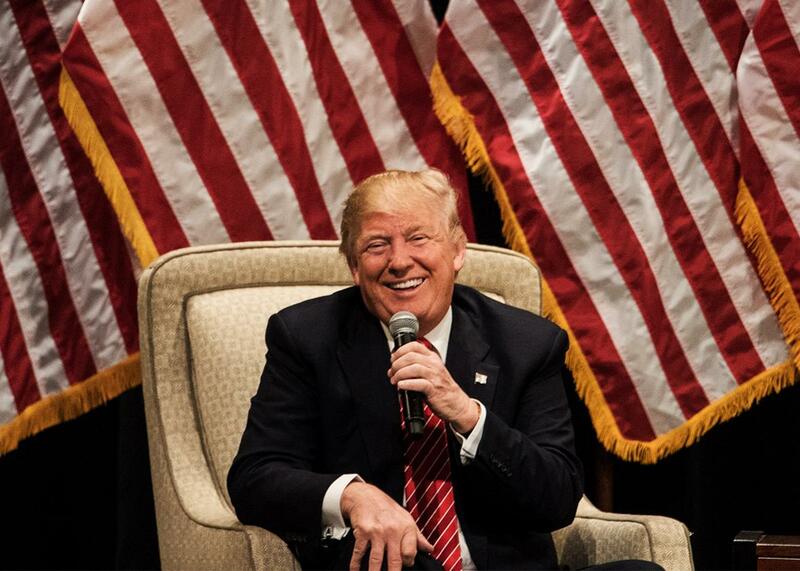 Republican presidential candidate Donald Trump during a campaign rally at Lenoir-Rhyne University on March 14, 2016 in Hickory, North Carolina. In recent days, Donald Trump’s campaign manager has been accused of assaulting a reporter (Trump defended his man), and the candidate himself has said that, as president, he might change libel laws and sue the media over negative stories. He has also urged violence against protesters at his rallies, while claiming that those protesters have violated his own First Amendment rights. With these events in mind, I called Geoffrey Stone, a University of Chicago professor and the author of several books on the tension in American history between the First Amendment and the executive branch, and on press freedom more broadly. We discussed whether Trump’s support of violence is illegal, the ways in which Trump might threaten the freedom of the press as president, and the consequences of a chief executive who despises the media. The conversation has been edited and condensed. Trump has encouraged violence against protesters at his rallies, saying he’d like to punch protesters himself, and offered to cover the legal fees of supporters who take matters into their own hands. Is such incitement covered by the First Amendment? He is inciting violence, but not in a way that could be punished consistent with the First Amendment. Under existing law, a person can be punished for encouraging others to commit crimes only if he expressly incites violence and his speech creates a clear and present danger of serious harm. In this context, the present danger element isn’t satisfied because there is plenty of time for others to encourage people not to be violent. Moreover, even if his expression creates a clear and present danger of violence, the First Amendment protects the speech unless the harm is serious. In these situations, a few fistfights probably aren’t sufficient to satisfy that standard. What do you make of law enforcement officials kicking out even nonviolent protesters from his events? These events are private. They are not government events. Like all private events, the host/sponsor is free to invite or exclude whomever he likes. There is no constitutional limitation on the private sponsor of such an event setting the rules for who can attend. It is like having a party in a restaurant and noninvitees crash the party. They are guilty of trespass and can be evicted and arrested. Of course, it’s a bit odd to apply that analogy to a large political event with thousands of people, but legally it’s no different. Put simply, as a private individual, Trump can invite whomever he wants to his party and if the purpose of the party is to celebrate him he can lawfully have those he doesn’t want there removed. Of course, if they aren’t being disruptive it’s politically awkward to remove them because you look like a jerk, but that’s never stopped Trump. How insulated is our system from a president who wants to go after the press? There are three ways in which a president can be punitive to members of the press that he does not favor: not invite them to press conferences, exclude them from access to other forms of information, and exercise the authority to prosecute them, hopefully when there’s a legitimate basis to prosecute. In terms of press freedoms, the president can’t do very much himself, unless you’re talking about something that’s violently against the Constitution. He would need legislation for the most part. The real question is: What is the vulnerability of the press to a president who is not respectful of the appropriate role the press plays, who treats them with disdain and regards them as a dangerous enemy, not only to himself but to the nation? There’s a large amount of information that the media get from the president that is then passed on to the American public, and that’s valuable, and a president has the authority to say, no, I’m not going to talk to you anymore. The “you” can be the entire press corps or it can be selected members of the press, and the problem of the use of that authority is that it then manipulates the press into currying favor with the president. I suppose we already have a version of that last part. Right, but it can get a lot worse, and if you want access to information, and if you have a president who says, “If you criticize me, you’re never coming to a press conference again,” there are members of the media who would shade what they say. That’s a huge power (and danger), which hasn’t traditionally been exercised in any aggressive way. We have many institutions in our democracy that operate on norms, not laws, and if someone or some people decide to violate those norms, then the system breaks down, as we have seen recently with Congress’s vow not to confirm Barack Obama’s Supreme Court nominee. It’s similar to what you’re saying about the press, right? Right, so there’s certain things the press has a constitutional right to do, and that we would hope the Supreme Court would continue to protect, so if the president wanted to literally censor the press because they were criticizing him, and to criminally prosecute them for that, the courts presumably would say, no, you can’t do that, and throw it out, but there are some things the president can do on his own. What normally keeps the president from doing stuff like that is he doesn’t want to be criticized, and one of the powers the press has is, of course, the ability to condemn and to criticize the president. Generally the president does not want to alienate the press, but if you have a demagogue, then they don’t care so much. So if you have a demagogue who doesn’t care about the press or elite opinion, then he will be more willing to go after the media? Right. The demagogue point is really an important one: the willingness to say, I’m not going to play by the rules, and I’m going to win, is what most presidents haven’t been willing to do. Here’s another part about it that’s relevant to the change in the press: There was a time when the press was pretty professional and sober and reasonably responsible. If someone undermined a part of the press, you could be sure that the rest of the press would stand up and defend him or her. Now, that’s not nearly as likely. The media have become so polarized that you have Fox News and MSNBC and that kind of scattered polarization throughout the media. Could Trump really change libel laws, as he has promised to do? No. The president doesn’t get to make the libel laws. These are almost all state laws and even if they were federal laws the president can’t do anything without Congress. More to the point, the limitations of the circumstances in which a public official can sue someone for libel (only false statements of fact made with reckless disregard for the truth) are set by the Supreme Court in its interpretation of the First Amendment. The president has no authority over that. Perhaps most important, though, to the extent Trump is complaining about what he describes as lies by the news media that defame him, they are already actionable under existing law. A lie is a knowingly false statement of fact. If such a statement defames a public figure or public official, it is by definition actionable even today. What do you find most troubling about Trump with regard to these speech issues? A lot of it depends on whether he gets to appoint Supreme Court justices. We have a First Amendment which over time we’ve come to define in a pretty robust way, and so the key thing is you could have a Sedition Act, right? You could have a law that says it’s a crime to criticize the president. We’ve been there; we’ve done that, right? It seems like that’s several steps off, but you can see how it all starts. Right, exactly. I’m not predicting that would happen. It would require both a Congress that would be prepared to do something like that, which, I have to say, is not completely unthinkable these days, but also, it would require a court that’s willing to uphold it, and that, I don’t think, is likely in the foreseeable future. But remember, the Supreme Court upheld the Sedition Act. How would you rate the Obama and Bush administrations in dealing with the press? My take is that they’ve done a reasonably responsible job with the press. The press doesn’t like certain things. It doesn’t like it when there are prosecutions for leaks, and I understand that they don’t like that, but I also understand why, from the administration’s standpoint, they feel the need to do it. They’re operating in an environment in which secrecy is often critical and critical to their ability to protect the nation. The press gets self-righteous about these things, and says you shouldn’t be interfering with us, with our ability to get information, and the executive, basically, has to say, well, that’s all well and good, but to the point that you are publishing information that is significantly undermining the ability to keep the nation safe, we can’t allow that to happen, and we can’t allow that to go unpunished. But even with respect to things like prosecuting leaks, my guess is the officials in the executive branch are very sensitive. On the other hand, they don’t want to alienate the press, and therefore, they probably tolerate a lot more in the way of what they perceive as press abuse than they would like to tolerate. My sense is that on the one hand, First Amendment and press freedoms increase with time. On the other, it does seem that on issues like secrecy and prosecuting the press for leaks, it gets worse with every term. Well, yeah. I think the problem of the press and leaks is a relatively recent phenomenon in terms of it playing an increasingly important role, and partly that’s because the opportunity for leaks was much smaller, if you go back 50 or 100 years. In a world in which we have much more complex investigative systems—like the NSA and CIA—the accumulation of secret information and data is far greater than it ever was. There used to be secrets, of course; there were secrets like how to build an atomic weapon, or when an attack is going to be launched, but I think the reality today is that the government is able to develop a much greater capacity to gather and to utilize information which it regards as secret, and the capacity to leak huge amounts of it is very different than it once was. It used to be that you’d basically have to take a piece of paper or you’d have to take what you could memorize if you were an employee, whereas today, if the security systems aren’t careful, you could, with the push of a button, release huge amounts of information. This all confirms my suspicion that we don’t want a demagogue as our president, so thank you.